OOOOPS! - Tom goofed up. I feel terrible for having failed to identify the wonderful "group of women business owners" I spoke with the night before last and for even the possiblity that anyone might get the impression from my original post that the group as a whole voiced or shared in the "objection" I was responding to (see below). Just from the name of the group, Women Business Owners Connection, you get the feeling they understand networking. When you spend a little time listening to them interact and get to meet their leadership team, that first impression gets confirmed. I told them so the other night. And it showed, I think, in the number of probing questions they asked that kept us on the topic of blogs as business networking tools for so much of the evening. Special thanks to WBOC President Julie Briggs of Syracuse Gift Basket for her warm welcome and follow-up support. I spoke last night to a group of women business owners and although the topic was "Books as a Calling Card," since we advocate blogs for both the writing process and as a marketing platform for authors and their books, the subject of blogs and "blooking" ("blook" def.) was included. This morning I found an email from one of the attendees objecting to my advice that "novice" (her term) business owners consider using a blog as their first (sometimes only) web presence. Her concerns revolved around the ability of a "novice" to establish credibility using a blog, because she has found "blogs to have a tiny bit of information relative to what I can get in a newsletter or a listserv in my field" and "a blog is more like an opinion piece that would be in a newspaper and does not contain as much good content as a well-thought and well-written content." She pointed me to an example of what she apparently regards as the right way to present a book online, described as "the first medical textbook on the web by medical professional for medical professionals, it is very rich in content." She pointed out that the doctor's website has "a well-thought out organization of information (information architecture) ... is user-friendly (usability) ... is accessible to users with disabilities ... [and] incorporates all the current web standards and conventions that make up a good website." And then she asserted that "a blog cannot do any of this." The oversimplified answer to your general observations about website vs. blog is that a blog IS a website. With all due respect, yes, a blog can be made to do any/all of the things you list – and it can add a level of interactivity that costs an enormous amount of money to reinvent/reproduce on a website. It seems to me there is a glaring disconnect between your expressed concern for novices and your advice that they engage in “information architecture.” The information architects I’ve met and read in my informatics courses don’t come cheap (and aren’t really interested in “small” websites/businesses anyway). We generally advise new bloggers against turning their blog into a website in the sense you seem to mean it. The consequence would usually be turning a simple, usable web publishing tool (for the novice) into a “sophisticated” website with a permanent umbilical cord to a blogmaster. Our goal is to help novices up the learning curve quickly to the point where they can handle their web presence by themselves at a small fraction of the long-term cost of a website. Spend a couple of weeks on blogs and you’ll discover they have their own design/usability/navigation conventions. You very quickly learn how to find your way around in the archives, categories, and comment streams. And they are text-based, which makes them fully searchable. Websites tend to be full of gif-swaps, flash, and other designer-beloved stuff that makes them less search engine friendly and means they darn well better spend a ton on usability testing, because the user will have no way of finding stuff on their own. Bloggers establish credibility in a number of very human ways that go far beyond the inert “credibility guidelines” we all use in the absence of human contact. That’s not to say the guidelines aren’t important or useful; nor that the credibility that grows from blogging is infallible. But over the long haul, credibility built on multiple contacts, first-names, conversations, exposure of ideas to near-realtime, public scrutiny, and the mutual desire (among bloggers who “get it”) to develop personal relationships, seems more reliable to me. The relationships we’ve developed all over the world through blogging have been rewarding and durable. 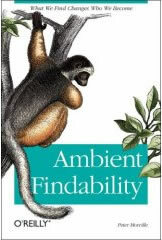 Your interest in information architecture should lead you to Peter Morville and his latest book, Ambient Findability (O’Reilly 2005). Oh, and his blog, findability.org. The entire book is a fascinating look at how information gets found, but find your way to the discussion of social software, folksonomies, and some of the blog-based, user-driven tools like tags, technorati, del.icio.us, flickr, and others. It’s what he calls “intertwingling” of information to the max! A well-built taxonomy is not the only way to "organize" information and there are emerging understandings about the value of less “structured” methods. Check out Morville's post on the meaning of "authority" and why some argue the wikipedia is more authoritative than Britannica. Intertwingularity is not generally acknowledged — people keep pretending they can make things deeply hierarchical, categorizable, and sequential when they can't. Everything is deeply intertwingled. Okay, I'm out of time to spend on this rant. Please contribute your thoughts. Should the question be Blog design vs Traditional website design? "There is a glaring disconnect between..."
"Disconnect" is a verb, not a noun. I think you meant "disconnection". Misusing this word seems to be very trendy now, particularly among politicians, but that doesn't make it correct. I kept meaning to get back to this and thank Observant for the "observation" about the usage of "disconnect" - however, I'm not sure what dictionary Observant consulted. There is no need for the noun form of "disconnect", when the noun "disconnection" already exists. Let us not needlessly proliferate words, when the English language has well over 600,000 words, of which most commonly use a miniscule fraction. Great blog, keep up the good work!! Have added it to my favourites!